Most of the production industries are holding a large inventory of costly equipment and machineries. To ensure its overall serviceability, operational accuracy, reliability, and optimum utilization, the necessity of scheduled and planned servicing needs to be emphasized. It is therefore intended to lay down these servicing procedures and allocate the responsibilities thereof. For efficient running of machine tools, it is very essential that care and maintenance of machine tools should be emphasized. The lubrication of machine tools must be regular, otherwise the parts will be corroded and it will affect the life of a machine tool. Following points are to be observed for care and maintenance of machine tools. (a) Machine should be cleaned after every major operation and before commencing work on different materials. (b) Swarf should not be allowed to accommodate in T-slots of machine table, bolts holes or in slides between working surfaces. (c) Machine bearing should be oiled at least twice a week. Table slides, cross slides and spindle loose pulleys should be oiled daily. (d) Accessories of a machine should be kept clean all the time. (e) The edge of table and T-slots must be kept free from burrs. (f) The hammering of the lathe centres and drill chucks in order to remove them from tailstock spindle and drilling machine spindle is a bad practice, must be avoided. (g) Grinding wheel of offhand grinders should be trued up weekly. The gap between work rest and grinding wheel should be adjusted and always it is to be maintained to 1/8”. (h) The side of grinding wheel should not be used and do not grind tools at one place of grinding wheel. This will make groove on the face of grinding wheel. (i) Before leaving shop, machine should be switched off. (j) Use of coolant is very essential. It increases tool life and distortion of work. (a) Cleaning by Partial Dismantling - Each machine should be partially dismantled for the purpose of cleaning at reasonable frequency. Partial cleaning can be carried out by the use of wiping rags. Greasy places are to be cleaned with a small paint brush soaked in kerosene. After completion of inspection and lubrication, the guards can be replaced. (b) Cleaning by Complete Dismantling - This method alone provides for thorough cleaning of mechanical device. In this process all oil or grease containers, such as gear boxes, oil reservoirs, etc. can be emptied, cleaned and refilled with new lubricant. This method also allows an inspection for worn out parts. Before assembling the parts, all oil and grease holes are to be checked for their alignment. Proper oiling and greasing is most effective application of preventive maintenance. A servicing schedule should be prepared for daily, weekly and monthly oiling and greasing of the machines. All oiling and greasing points are to be marked with appropriate colour code. Make all minor repairs as soon as the need arises. For instance, if an oil cap is broken off or a thumb screw is lost, replace or repair. Clean the machine after every use. 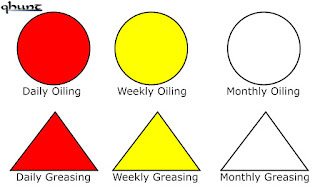 Check oil line in sight glass, alignment of oil holes and grease holes at each lubrication time to see that they are open and that oil or grease is reaching to the bearing. (i) Apply anti corrosive coating such as oil, grease, paints, varnish. (ii) Covering with water proof, weather proof roofing, etc. in storage. (iii) All machine slides, ways, gears and moving parts should be applied with thin coating of machine oil to prevent it from rust. (iv) Use of mallets, hide faced hammer, wooden strips or blocks for removal or supporting of parts, is a method of preventing the damage of the parts. (v) Machines should be repainted at reasonable intervals. (b) Corrective Maintenance. Corrective maintenance is applicable to the machines which are in daily use and become unserviceable due to fair, wear and tear. After the prolonged use of machineries the sliding surfaces, screws, dovetail ways, bearing housings, shear pins and fasteners of pulleys, ball and thrust bearings become worn out, belts and chains get elongated. Therefore, inspection and replacement of such parts/components is periodically needed. (a) Periodical servicing, meticulous examinations, checks or tests at specified intervals are to be carried out to ensure efficient and satisfactory performance of systems till the next servicing falls due. (b) Repair/ replacement of worn-out or defective parts are to be carried out to ensure the overall serviceability of the item. (c) Replacement of parts which once removed cannot be used again, is to be done, e.g. oil seals, gaskets, “O” rings, etc. Also those parts which have a stipulated life are to be replaced with new parts to avoid failures. (d) Necessary checks, adjustments, alignments and lubrication at specified intervals are to be carried out. (e) Painting and touch up of each machine is to be done every year. (a) Daily Inspection - It is to be carried out by machine operators. (b) Weekly Servicing - It is also to be carried out by machine operators. (c) Monthly Servicing - It is to be carried out by Plant Maintenance Section(for BRDs) and by Station Workshops (for Wings / Stations). (e) Half yearly Servicing - It is to be carried out by Plant Maintenance Section (for BRDs) and by Station Workshops (for Wings / Station). Servicing carried out on sudden breakdown of machinery and plant is termed as unscheduled servicing. Station Workshop/ Plant Maintenance Section will be responsible for all unscheduled servicing. In case of Wings/Stations, if the nature of work is beyond the capacity of the Station Workshop then a detailed survey report has to be compiled by CEO/ Squadron Commander Maintenance group. This report should contain complete information regarding the machine, i.e. its make, model, grade, hours run, nature of defect / work involved, nature of assistance in terms of tools, equipment, spares, etc. which are required to carry out the repair. This report should be sent to Head Quarter’s Maintenance Command (HQMC). HQMC will arrange for its repair, rectification or advise its disposal. Wings/Stations will be responsible for the procurement of spares/components required for servicing. These spares will be procured prior to visit of repair team. Servicing schedules are already provided by the manufacturers for all the indigenous class "A” machinery. However, the schedules may not be available for some of the machineries and plants imported in the past. In such cases, to ensure uniformity, servicing schedules as given in Appendix “A” of TSI Volume III, Section ‘G’ may be followed. Where the items are not covered in the above instructions, a suitable schedule may be worked out by the operating unit and forwarded to Command Head quarters for their approval. In order to facilitate periodic operations like oiling, greasing, etc. a colour code is evolved. These colour codes are to be shown on a board and hung in the hangar. The colour code should also be marked on the various lubricating/ greasing points of the machines.